This year the legendary Battledecks returned to SXSW Interactive 2008 for Battledecks II which took place on Friday, March 7th and featured several speakers giving improv presentations to a set of slides from PowerPoint decks that they have never seen before. Each speaker’s talk was then voted on by a panel of judges. Rocketboom put together a really great video of Battledecks II. Roo Reynolds shot a video of the winning presentation by Anil Dash. Mike Monteiro of Mule Design Studio created all of the hilarious Battledecks slides and he posted some of his favorites to SlideShare. Lewis Wallace reported on Battledecks II for Wired’s Underwire blog. Next year I vote that Battledecks be one of the keynote presentations. 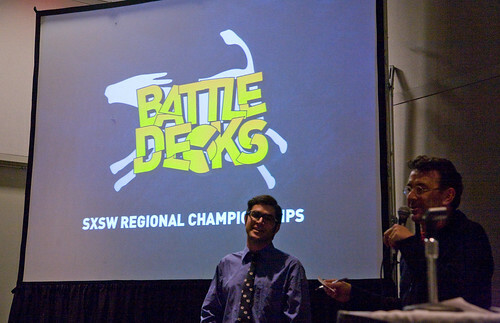 Head’s up, the San Francisco debut of Battledecks will be taking place at our Laughing Squid event on May 31st.